Yesterday, we attended what was the last in a wave of kids' birthday parties that Lam and Mini were either invited to or had hosted for themselves. A whopping 6 in total. Yeah, my kids are little party animals - they're getting fitted for a toga party next week. Kidding. Anyway, our grand finale event was for LG, who is 11 days younger than Lam and #2 in my friend harmzie's brood. LG invited her friends to celebrate at Miracle Ranch, where they had the opportunity to ride a horse led around a trail, roast weenies and marshmallows, and of course, pig out on cake and ice cream. Lam and Mini loved it all! Mini especially enjoyed making new girl friends - a change from her brother's buddies, who are all guys. 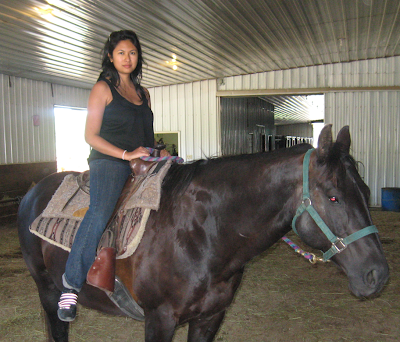 As you can see, I had a chance to sit in the saddle too. The beautiful horse you see in the picture with me is Fudge. Very gentle. The last time I was on a horse was almost 30 years ago on my last visit to the Philippines, but as Fudge and I rode a circuit around the room, it was as if no time had passed. All in all, it was a great afternoon spent with great friends. Thanks for a wonderful party, guys - It was a special honour to celebrate with our LG! Awwww! Looks like fun! You look pretty happy up there on horseback. Makes me miss my riding days.